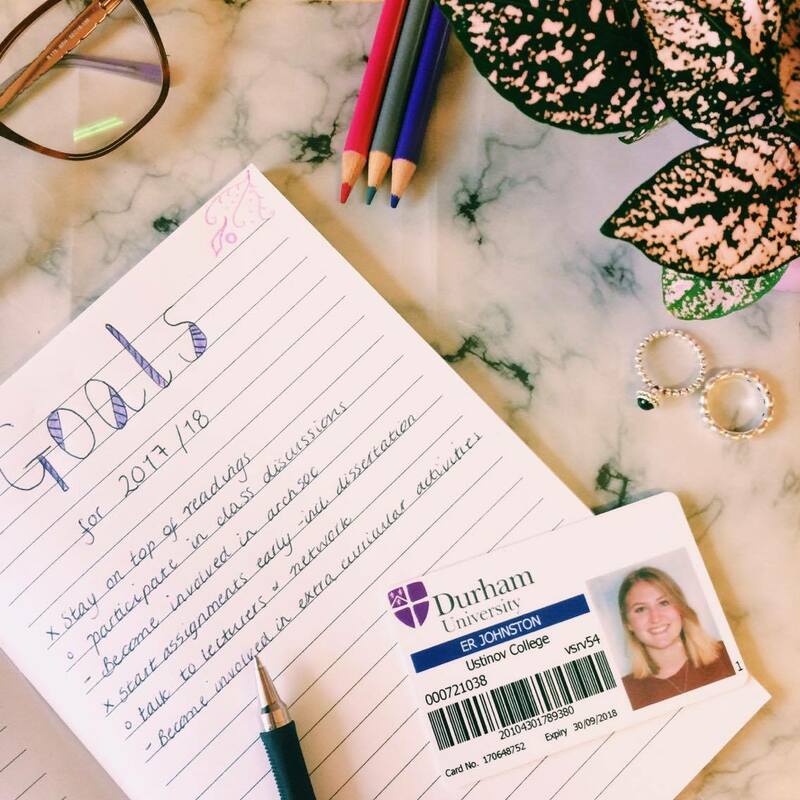 At the start of a new school / uni year, I think its important to set some goals for what you'd like to achieve in the year. I like to take a bit of time to really think about where I want to be at the end of the year. The question of 'where will I be this time next year?' may seem daunting, but once the first deadline hits, time really does fly. Before you know it, you're awaiting exam results and booking graduation gowns. Without a set of goals for the year, its can be easy to forget where how far you've come, and how much you've developed throughout the year. 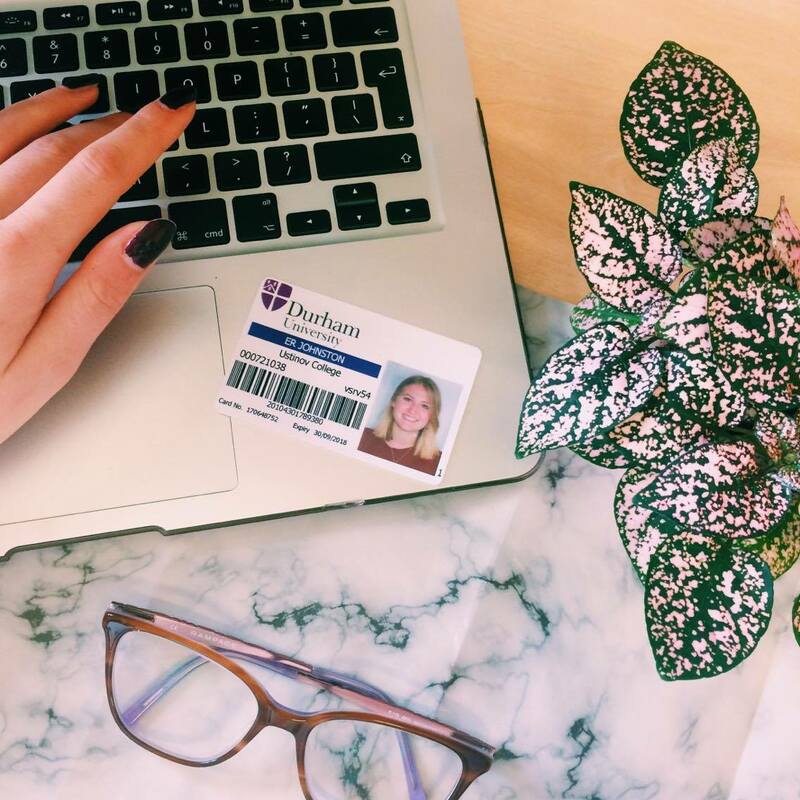 It can also be easy to just focus on the deadlines and neglect all the other important aspects of university - social events, networking, gaining experiences and of course some relaxation, are just as important as gaining that degree certificate. 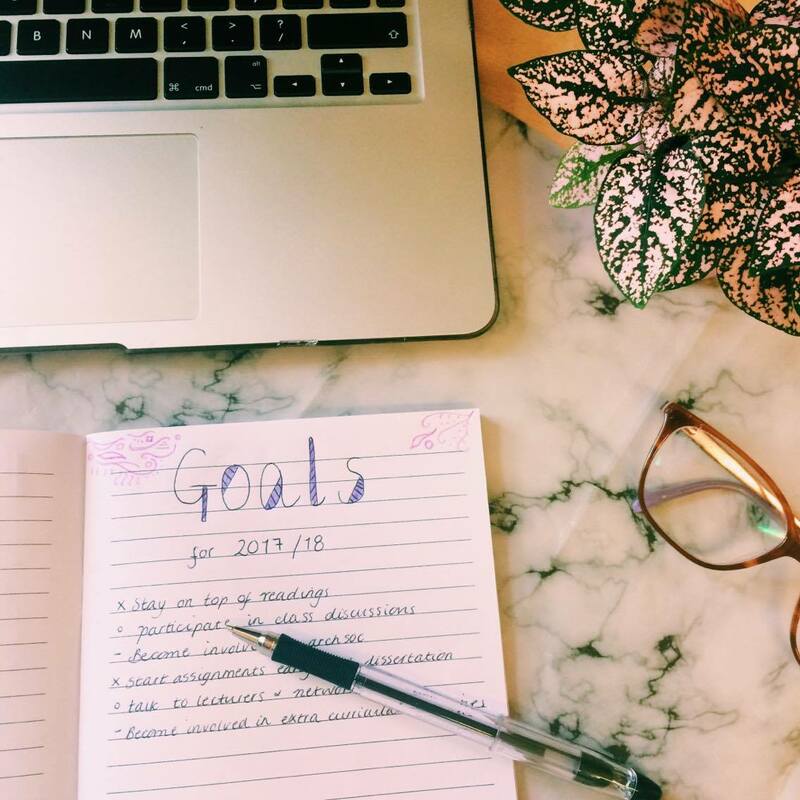 I've talked about the importance of staying organised at university before, and one of the best ways to do this is keeping a set of goals. So as induction week is over, and I'm slowly settling into the rhythm of classes and readings once more, I thought it was time to share some of my goals for this coming year. 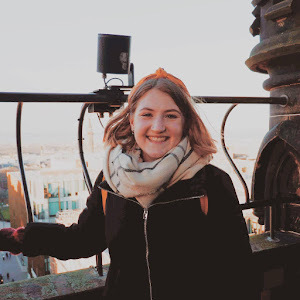 After all, its a big year for me - a masters degree is a huge step up from the undergrad, so its important for me to keep on top of everything at the same time. Here's something that should be easy to do - but for a shy soul like myself, who can turn a lovely shade of red at the mere mention of my name - this is something that I've got to push myself to do. Keeping on top of the readings will hopefully follow on naturally from last year's library days, so this goal should be achievable. But with class sizes shrinking, more attention will be put on those who don't offer up an answer. So by doing the weekly readings (and hopefully more) I should feel more confident when offering an answer in class. The department society is a common feature of disciplines in every university, and archaeology is no different. Throughout my undergraduate, I never tried to get involved in the archsoc, with only occasional appearances at the odd lecture that interested me. However, this year I've set this goal to make sure I'm interacting with other people in my department through the pub socials, as well as widening my knowledge by going to lectures even if they're not just to do with my 'area'. After four years of an undergraduate degree, I've found the techniques that work for me when it comes to essays and deadlines. The linchpin for finishing a deadline on time is to start early. Now that I know when my deadlines for this term are, and I've got a wall planner and a diary to keep me right. Starting a few weeks in advance gives me enough time to research, write and sometimes rewrite essays. Starting assignments early includes my dissertation - although not due till September 2018, I plan on finding a topic and supervisor nice and early so that I stay on top of things. Throughout my undergraduate I quickly learnt that talking to lectures will help both in and out of class. I've had many opportunities come from popping along to office hours, so this year I'm determined to do the same. Especially here in Durham, where so many of the lectures are leading in their fields. As I said before, your uni career is shaped not only by the lectures you attend, but also the things you do in your spare time. While binging the new season of Stranger Things or Riverdale may seem like the best use of a day, realistically being able to relay conspiracy theories about the Mandela Effect, or why Avril Lavigne died and was replaced with a look a like won't really add anything to your CV. Instead, this year I plan to get involved in other activities. I've signed up, and had my first class, learning hieroglyphics and I'm planning to become involved in the college magazine. As well as CV boosting activities, its also important to have some fun, so I plan to make it along to the weekly pub quiz night at the college bar and go to a formal or two. Just wait till this time next year when I'll be able to look back and hopefully tick all of these off! Can't wait till then? Make sure you're following on bloglovin for all my new posts. Remember, I've got a new posting schedule: Mondays - lifestyle; Wednesdays - fashion; Fridays - student. I definitely found talking to my lecturers helpful. I was so unorganised first and second year but hoping to keep on track now! Good luck with the diss!